I'm not ready to take the poll! I think the most important question from a pragmatic perspective is point #2. If the effect is sufficiently removed from the total process, i.e. 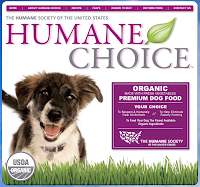 if every dog owner switched to humane food but that switch had zero effect on factory farming then it is a difference that makes no difference, and the entire question becomes largely moot. Buy a range of high quality dog food, including humane food. Buy the food they strongly prefer. No one asked all those exploited animals what their preferences were! If your dog prefers to eat animals, but the animals prefer not to be eaten, how do you adjudicate? Here is the whole problem of domestication in general. As Wayne says: don't buy the dog in the first place. We've already altered, bred, domesticated dogs, and done the same with all the other animals. So when you have a conflict between two different domesticated animals, where one is sacrificed for the dietary needs of the other, isn't the choice arbitrary? Yes and no. Yes it is arbitrary in the sense that we have already manipulated these animals through breeding into their currrent manifestations. So their role relative to each other and ourselves is up to a point determined by us. If aliens came down and freed all out captive animals and then removed all humans from the planet there would be a preiod of...adjustment the countours of which would be hard to determine. No it is not arbitrary in the sense that we can discern a "natural order." Dogs have at least some omnivorous capacity. There are other animals that don't. If you were taking care of a pure carnivore, it would (likely) be cruel and destructive to try and feed them an inapropriate diet. Isn't one of the cruel things we do to factory farmed animals feed them totally inapropriate diets? Why does this not apply to carnivores also? But here the "natural order" which perhaps we should just call the "given" order, collides with our "contrived" order. Where do we draw the line? If in theory we could breed predation out of the biosphere, should we do that? Or if we really are "respecting" the "autonomy" of the "natural" order, don't we need to respect the predators too? But our dogs are not "natural" in the strict sense, having been bred to be what they are. Should we complete their transormation and breed them into vegan animals? Or simply stop keeping pets entirely? It's interesting how a dog is an intermediate between a natural animal and an invention--what with all that tinkering with genes and features. Yet a dog has all the experiential potential of a 100% natural wolf. So--their pleasure/pain does matter. After writing the post I thought a little more about #4. We already do ridiculously privilege pets, giving them room and board and a seat on the couch. So we can't pretend we really give equal consideration to dog interests and cattle (etc) interests. We could reduce our favoritism though, by not going as far as to kill other animals for our pets to consume. The question I like to focus on is the question not of distributing vegan food to Lions, but the question of breeding predation out of existence. 1. Killing is wrong no matter who or what does it (it violates the desire of every being to live). 2. The autonomy of nature must be respected. (It's not OK to breed animals for our own purposes). 3. Lions (and cats and dogs and wolves and and and) according to (1) are instinctualy programmed by their very nature to do wrong. 4. But we can't breed this out of them because of (2). 5. Distributing vegan food to lions may seem to solve this problem, but this assumes that the vegan food actually satisfies all the relevant instincts and cravings. Otherwise you are violating the lions autonomy. Now I happen not to agree with 1. and I'm very ambivalent about 2. but I think you probably do think both 1. and 2., and therefore have quite the quandary. Or maybe I'm wrong. I like the concept of the autonomy of nature, though some would find it hocus pocus. (How can natre, not an agent at all, be autonomous, or not autonomous? Why give nature a type of respect normally reserved for individual human beings?) If we should respect the autonomy of nature, then definitely we can't breed tinker with lions and turn them into vegans. I definitely lean toward leaving nature alone...even if it's red in tooth and claw. I don't trust human beings to give all of reality a make-over. I thought about this a lot when I had my four cats. But cats need a higher protein content than dogs and it was hard enough to get them to eat as it was, so I never ended up switching them to vegie food. But if it had been possible to get a vegetarian diet that was as healthy for them and as attractive to them, I'd have switched for the same reasons I'm a vegetarian myself - to lessen the suffering of other animals. For a long time we fed our cats the fish variety of cat food, thinking at least we weren't supporting factory farming. Unfortunately, one of them wound up with bladder stones and has to be on one of a prescription diets, so that didn't last forever.